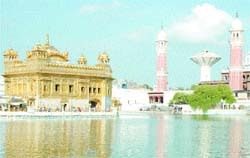 The restoration work of ancient Ramgarhia Bungas and Gurdwara Baba Atal is likely to be given to experts in the forthcoming meeting of the SGPC executive , likely to be held here on September 4. SGPC chief Avtar Singh held a preliminary meeting with heritage experts and the deputy commissioner to work out the details of the proposed restoration work. Earlier, the kar seva, carried out to repair the age-old murals at Gurdwara Baba Atal, and repair work of historical Ramgarhia Bungas had earned flak from the heritage lovers. Shockingly, during the previous kar seva carried out in 1992, bathroom tiles had replaced the frescos on the walls of the ground floor. Interior walls of the first floor were adorned with murals depicting Sikh history. Less than 100 panels of murals had been left on the first floor of Gurdwara Baba Atal, while rest of them have been obliterated beyond recognition. The kar sevawale babas, who are using the “Bungas” as their abode these days, have allegedly damaged certain portions of the building within the precincts of Darbar Sahib itself. They have built walls under the arches on the ground floor and fixed doors to convert verandahs into rooms. The brickwork (Nanakshahi bricks) has been plastered and painted at many places. Due to hindered ventilation, there is seepage in the basement of the “Bunga”, which could render irreparable damage to the building. While constructing the “bunga”, care was taken to provide natural light and ventilation through ventilators, which open in the path around the holy tank of Harmandar Sahib on one side and in the well dug on the other side. The basement just below the ground-level accommodates a hall for Maharaja, where he used to hold his court in “Diwan-e-Khas”, accommodating around 300 courtiers and soldiers. Due care was taken to keep the level of the throne (made of marble and decorated with engravings) at a level lower than that of Akal Takht. There is also a room that was used as jail for political prisoners. Another room on the other side of the wall facing the throne was the treasury where steel chests were installed for rooms of “daffadars” (security in charge of treasury) and security staff. All these are in a dilapidated condition these days.